While Chia seeds as a healthy food source may seem like a new idea to many people, these seeds have actually been around for a long time, and are gaining new popularity as part of a healthy diet for many people. Since information is essential in determining whether or not these seeds are right for you and your family, we would like to start this chia seed review, by offering some helpful and interesting information regarding these tiny little seeds. While Chia seeds may seem like a new food to much of the world, they have actually been a vital food source for thousands of years to people in Mexico and Central America. Recorded references of using these seeds goes back to at least 300 A.D. With references dating back long before then. The Mexican state of Chiapas literally translates to “River of Chia.” While there is strong evidence that the Aztecs also cultivated and used these seeds in beverages, medicines and paint. When the Spaniards invaded the Aztecs and Mayans they wiped the use of chia seeds out of these areas and forced the people of the region to use other grains. 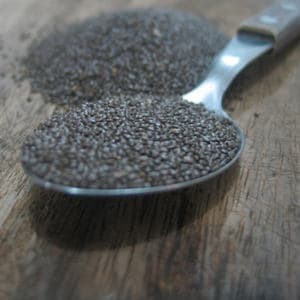 However in recent years chia seeds have regained much of its popular status in countries such as Mexico, Argentina, Ecuador and Guatemala although surprisingly enough the largest producer of Chia seeds today is Australia. However, today with various studies and hundreds of articles having been published on the health benefits of these seeds, many health conscious people are beginning to include chia seeds as part of a healthy and nutrient rich diet. The entire reason for adding Chia seeds to your diet is because of the health benefits of these seeds. So knowing some of these benefits will be helpful in your determining if these seeds will be beneficial to your health. Here are just some of the benefits of these little seeds. 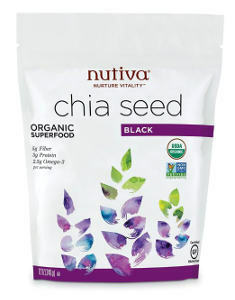 Great Nutritional Elements: For starter chia seeds are loaded with nutrition. They have a good deal of protein, lots of fiber, and are loaded with vitamin and minerals. These benefits alone can help the average person ensure they get many necessary vitamins and minerals as well as giving vegetarians and vegans a source of protein. Omega 3 Fatty acids: In addition these seeds are high in omega 3 fatty acids. 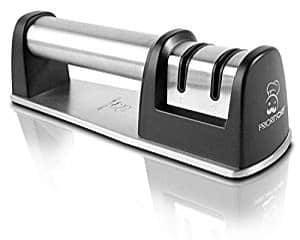 Omega 3 fatty acids help to reduce inflammation in the body which can help to reduce joint pain for those suffering from arthritis, reducing inflammation in the body can also reduce your risk for other serious health conditions such as cancer, diabetes and heart disease. High in Anti Oxidants: Chia seeds are also high in anti-oxidants which can help to fight free radicals that cause everything from wrinkles to cancer. Blood Sugar: In addition, chia seeds also can help to regulate blood sugar levels and help you to stay hydrated. Chia seeds may have some side effects for some people. 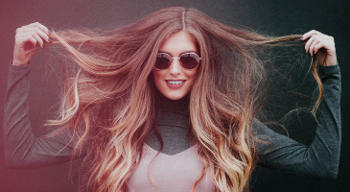 While most people experience mild versions of these side effects they should be noted. Flatulence: Some people experience excess gas with chia seeds especially in the first few days. To avoid this side effect, start with less than the recommended amount of these seeds and slowly add more as your body becomes accustomed to this new food. Allergic Reactions: A few people who are allergic to mustard seed also find themselves allergic to chia seeds as well. Thins Blood: People on blood thinners do need to be careful eating these seeds as the omega 3 fatty acids in these seeds also thins blood. In addition, it is not advisable for pregnant women to consume chia seeds as no studies have been done on the effects of these seeds during pregnancy. 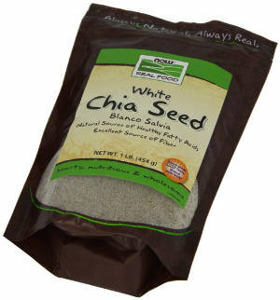 What is the Difference Between White and Black Chia Seeds? While some people find white chia seeds to be more aesthetically pleasing when added to certain foods, there really is no difference in taste or nutritional value between the white and black chia seeds. Any differences in nutritional value will be due solely to where and how the seeds are produced. How Many Seeds Should You Eat a Day? It is recommended that you consume 1 to 2 tablespoons of chia seeds each day to get the full range of nutritional benefits from these seeds. However, if you are new to chia seeds, it is best to use less than recommended amount until your body becomes adjusted to this new food in order to help reduce any possible side effects. Try starting with one teaspoon of seeds for 3 or 4 days and gradually increasing the amount until you reach the recommended amount. One of the great things about Chia Seeds is that they can be consumed in a number of ways. You can simply soak these seeds for several minutes or overnight and drink them. Put them in cereals, soups, yogurt, smoothies, shakes, on salads or bake them in cakes, cookies or muffins. They can be added to just about any type of food. If you soak the seeds you can also use the gel like substance for a substitute for butter or eggs. Now that you know a little something about Chia seeds, lets review some of the chia seeds that are available as a dietary supplement. 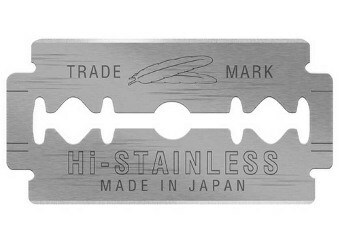 They are chemical and Pesticide free. 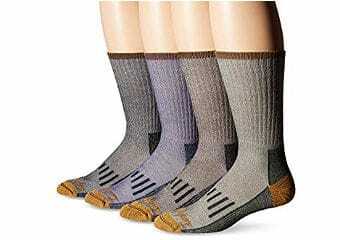 Comes in 2 pound or 5 pound packages. While the company states that these seeds are chemical and pesticide free no where does it say that these seeds are organically grown. This could be due to the fact that Healthworks has not been through the costly process of being designated as organic, or it could mean that the area where these seeds are grown do not meet all the criteria for being considered organic. However, they do state that they are free of chemicals and pesticides which is the main reason for choosing foods that are organic. Therefore we find that these seeds may well be worth considering as a healthy addition to your diet. 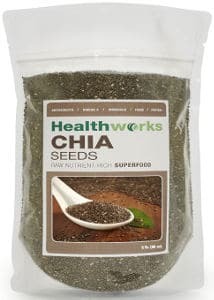 Reviews and ratings for these Healthworks chia seeds are exceptionally good. While most reviews do restate the benefits of consuming these seeds that have been published in a variety of sources. There are some actual benefits users noted when using these seeds. Helped some users with their weight loss efforts. Helped some users reduce pain in the joints. Helped some people feel full longer after eating. Viva labs is a supplement company built by doctors, nutritionists, and homeopaths. Their organic chia seeds is just one of this company products. Comes in a 1 or 2 pound bag. 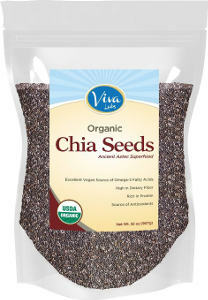 These chia seeds are certified 100% organic and have 139 calories for 2 tablespoons. They can be used as substitute for butter in frying and eggs in baking when soaked in water until a gel forms. They are also great when sprinkled on cereals, salads, and put into chicken, deviled eggs and more. We like that this seeds are organic, since it is the seed of any plant that often get the highest percentage of pesticides and chemicals from chemical fertilizers. Since you won’t be ingesting any chemicals with these seeds chances are good that you will get more nutritional benefits than from seeds that are not organic. Comes in a 12 ounce package. 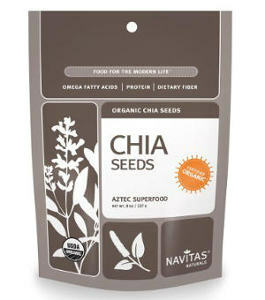 Nutiva are raw whole chia seeds with about 28 to 30 servings per 12 ounce bag. These seeds are grown in Mexico. We like that these seeds are organically grown and offered in a 12 ounce bag as it gives people who want to try these seeds the option of purchasing a small amount of these seeds. However, these seeds tend to be somewhat expensive. 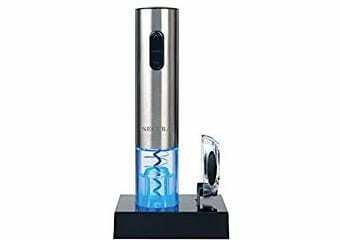 Helps you to feel full longer which can help when dieting. Seems to help reduce some IBS symptoms. Seeds taste nice and fresh. Navitas Naturals was founded in 2003 and is a company that offers natural foods from around the world to supplement western diets. 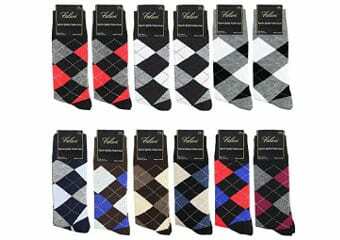 Can purchase in quantities of 8 0z, 16oz, 32 oz, or 48. Oz. Navitas Natural organic raw chia seeds come in a mixture of light and dark seeds and a variety of different sizes to meet the needs of individual families. While we like the fact that these seeds are organic, we do have concerns after reading that some users found rodent droppings in their seeds. While it is natural to sometimes find small twigs in seeds this small, we find it worrisome that users are reporting mouse droppings right in the seed packets. Reviews for these Nativas organic chia seeds are extremely good overall. However, several users did report finding rodent droppings in their seeds causing them to have to dispose of the entire bag. Helped individuals to feel full longer. Helped some people with high blood sugar levels keep their glucose readings in check. 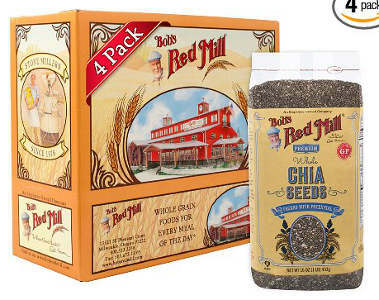 Bob’s Red Mill is known for it’s nutritious whole grains, beans and seeds. Mixture of light and dark seeds (more dark). Can purchase in a 16 ounce bag, 2-16 oz bags, or 4-16 ounce bags. There is nothing on the company’s official website to indicate that these seeds are organically grown. This may or may not be issue for some people. While we do find that this company produces good chia seeds, we do wish they were organically produced. Reviews and ratings for these chia seeds are outstanding. Users find the following benefits of these seeds. Helps with appetite control and weight loss. White rather than black seeds. Can purchase 1 or 4 pounds. While these white chia seeds are non-GMO they are not organic. This may or may not be important to some consumers. There are few companies that sell white chia seeds so these seeds will certainly meet the expectations of those consumers who prefer the lighter colored seeds to the darker ones. Simply look more appetizing than the darker seeds. 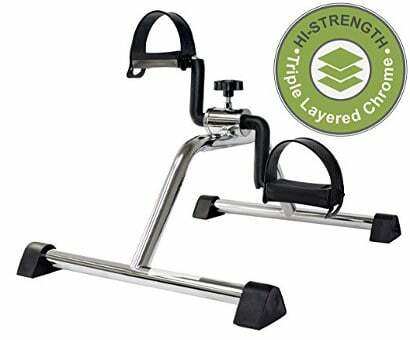 Helped some users with weight loss. Hopefully, you found the information and reviews of different chia seeds useful in deciding if these little seeds were right for you and your family.